Minimally processed carbohydrates (carbs) are an important part of eating the Med Way. Go Med and eat well by using the carb choice continuum to guide your selections. Eat lots of fruits, vegetables, and legumes (beans) throughout the day. Choose starchy vegetables (potatoes, peas, and corn) less often than other vegetables, as they are not shown to have the same protective effect. Eat grains as grains. Choose whole grains such as oatmeal, quinoa, brown rice, popcorn, and bulgur. Eat unprocessed whole grains in combination with lots of fruits, vegetables, and legumes for a delicious Med Way combination. Choose lightly processed whole grains such as rolled oats and whole grain pasta. Choose 100% whole grain foods such as breads, crackers, and cereals. 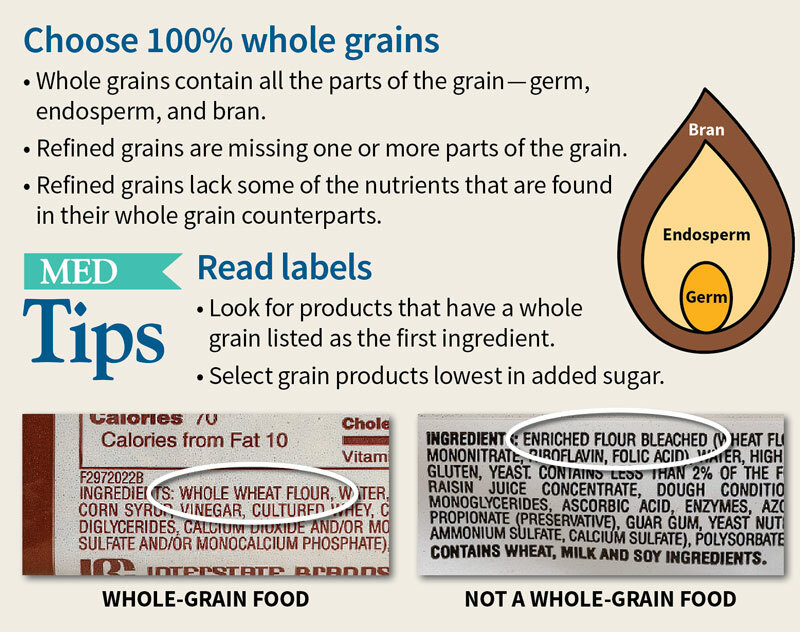 Look for “whole” as the first ingredient in the ingredient list (e.g., “whole wheat”). Opt for whole grain foods that are made with minimal ingredients and minimal added sugar. Add vegetables, beans, and fish to refined grain pasta. Add vegetables, beans, and fish to refined grains such as French bread or white rice. Eat and drink rarely—at most a few times a week. Beware. Sometimes grain foods high in added sugar and saturated fat are made with whole grains. While most whole grain versions are slightly healthier than refined grain options, a whole grain cookie is still a cookie, so save these types of treats for special occasions.